Gualdo Tadino | Travel Umbria! 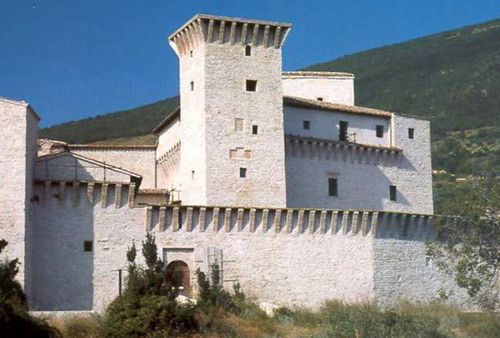 Just east of Gubbio, Gualdo Tadino is another Umbrian hill town that occupies the site of ancient Tadinum, a Roman staging post on the Via Flaminia. The town is of both Umbrian and Roman origins, and has endured a tormented history until the 12th century when it was resettled on it’s present site. Today the town which sprawls across the lower slopes of the Apennines mountains is a quiet place best known for it’s ceramics. Gualdo suffered substantially in the 1997 earthquake and has almost been completely restored since then. How To Get To Gualdo Tadino – Gualdo is situated in northeastern Umbria and can be reached by train, or by bus from Gubbio or Foligno. Gualdo Tadino has a railway station on the line from Ancona to Foligno, with some trains continuing through to Rome. The journey time to Ancona is typically one hour and 45 minutes, and to Foligno 40 minutes. What To See In Gualdo Tadino – Gualdo Tadino, famous for its ceramics industry and art, lays on Sant’Angelo hill dominated by the castel “Rocca Flea”. Although not considered a historical landmark, the historic town center has some interesting civic and religious buildings. The Duomo, also known as San Benedetto, is located in the central Piazza Martiri della Liberta and has a facade quite similar to Todi’s Duomo. The facade dates back to the 13th century, and had to be carefully restored after the earthquake. The interior was completely rebuilt in the 19th century and hosts some beautiful 20th century frescoes. Outside the church to the left is an attractive Renaissance fountain. Opposite the cathedral sits the Palazzo Comunale, with origins from the 18th century along with the Palazzo del Podesta. TheChurch of San Francesco has been deconsecrated and is now used to house temporary exhibitions and features frescoes on the Life of St. Julian by the school of Ottaviano Nelli. At the top of the hill the Rocca Flea can be found, a fortress whose origins date back to the 10th century when the construction began on the former site of a church. Today the fortress has over 40 rooms and reflect the influence of Frederick II who made improvements to the castle during the 13th century. The Rocca houses a Pinacoteca, or art gallery, a ceramics gallery, and a collection of archeological finds.